you know how i’m always praying for peace for mankind? and i mean it when i’m doing it but people are crazy, so that seems like a no win situation right now what with Syria and Ukraine and the islamic state of whatever they’re calling themselves right now. I could go on but you already know i’m sure. i’ve been feeling like i can’t make a difference in the world and i want to see some points in my accomplishment column. well i thought i’d change up a bit. i’ve never asked for clothing but this is an exceptional instance. i was perusing the august issue of Vogue and i saw a couple of photos that struck my fancy, nice quaint phrasing right? the clothes spoke to me. you know how i just cleaned out my closet and donated a bunch of stuff right? well i’m going to need to replenish the closet with new goodies and by goodies i mean clothes and shoes and scarves and well other stuff. i need to wear something right? something might as well be really good. any who, i promise to look cute in it when i wear it and i won’t throw out tons of attitude but it is Chanel so that implies that there must be some ‘tude but i will keep it within reason and i won’t smack anybody. i can’t say i won’t think about it. you know i’ve been trying right? there’s that guy i always say hello to and then call him a jerk in my head. well, i’ve started apologizing after i call him a jerk, even though he totally deserves it, but i apologize in my head anyway because i know it can be perceived as wrong. any way if you make sure i get those clothes i will make an effort to be a better human being like i’ll do more recycling and donate some more stuff to charity and by the way i just renewed my PBS membership, for the children of course, and that should count as something. i didn’t even ask for a thank you gift and they totally offered it to me. see. i’m trying anyway so i’m thinking if i buy the outfit could you make sure i get the money back as quickly as possible and by quickly i mean i don’t want to spend it at all but i do want the clothes, and by “clothes” i mean the shoes and bag that go with them because we cannot short change the look right? anyway that’s my prayer/chat/meditation for now. thanks for always listening. i bet i could totally make a difference wearing one of those outfits. did i mention there are two of them? and if you want i will say a prayer for peace while actually wearing them, that’s if you want, but my mind probably wouldn’t be in the right place right then seeing as i was wearing my first Chanel. did i mention it would be my first Chanel? i’m not talking lipstick or blush i’ve totally had that, but clothes. i’m getting excited just thinking about it and you know how tired i’ve been lately. i totally deserve this! 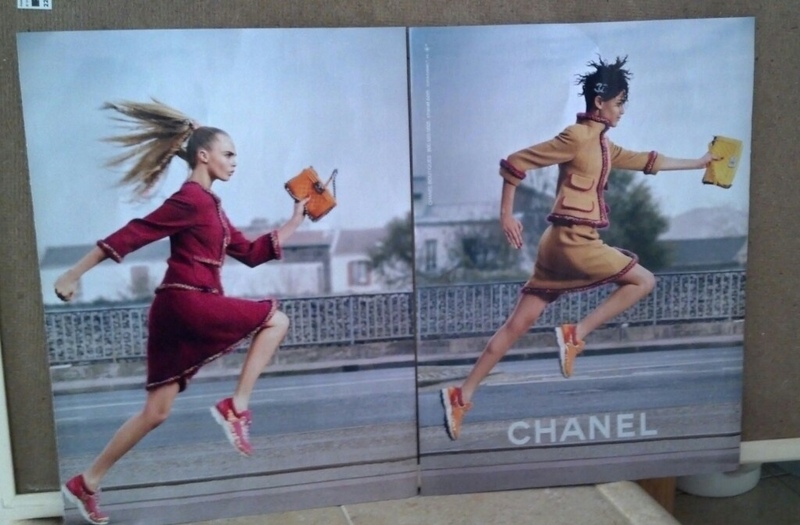 i totally would have gotten that promotion if was wearing Chanel. Anna Wintour would totally take my calls if i were wearing Chanel. i mean i’ve never tried to call her but if i did who knows? is it to much to ask how these items will be delivered? i know. i’ve said too much. shhh. i’ll be quiet now and wait for the miracle. i need to look good when i’m wearing the September issue of Vogue. I love your writing. i love it.